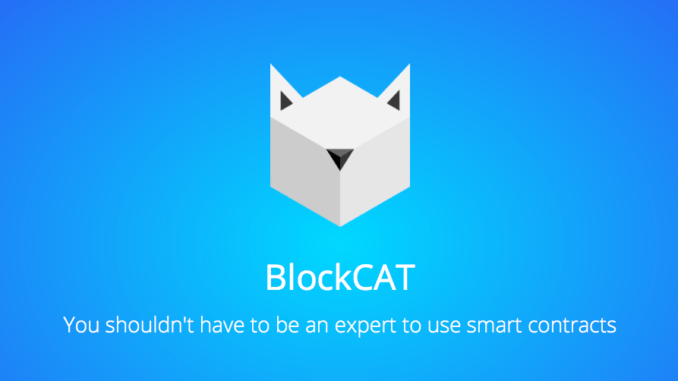 Canada-based BlockCAT is setting out a future where people who need to create commercial contracts do so simply by buying a smart contract from their online marketplace, fill in the details and upload the ‘paper’ to the Ethererum blockchain. The smart contract then has all the benefits one would expect, such as self-execution, high levels of security, permissioned access and ‘one version of truth’ which prevents fraud. The company’s focus at present is on relatively straightforward contracts that would cover areas such as purchase and sale agreements, crowdfunding and online auctions. But, this is just the beginning. Grand aims indeed. Are they realistic? Well, consider this: just yesterday, Artificial Lawyer covered the news that global insurance company, AXA, had publicly launched self-executing smart contracts for flight delay compensation, also interestingly using Ethereum to hold the contract once completed. The technology is well and truly out in the public domain now and even giant companies are in effect ‘selling’ it to consumers. It’s no longer just for blockchain geeks and digital currency experts. BlockCAT is not necessarily unique, there are other companies seeking to create smart contract marketplaces, such as Agrello. US-based Clause is seeking to build legally compliant smart contracts, so too is US/Swiss project OpenLaw. There is a lot going on. But, is the legal world keeping pace? While some developers are very focused on ensuring everything is legally solid and their applications are designed for use inside law firms, others, such as BlockCAT are painting a future picture where lawyers may be involved perhaps in creating templates, but thereafter not involved. In effect they’re looking at a lawyerless market for buying smart contracts and then making use of them. You can also develop and sell your custom contracts on its decentralised marketplace. I.e. lawyers who feel they can make some income sending out great templates into the world can do so, effectively undermining the idea that contracts are too complex to handle unless forged and negotiated within the magical, blackbox environment of a commercial law firm. But clearly there must be a killer problem with all of this? One challenge is that the company has done an ICO and created its own coin so that people can use that token to purchase services from BlockCAT. It will raise a load of money for the founders, but it also puts a barrier between the contracts and people who are not used to dealing with more than fiat currencies. The other challenge is how does the client know these are going to be wholly legally compliant contracts? Won’t they still need a lawyer to go back and check the smart contract and ensure that its watertight and compliant, even if the template was created by a lawyer somewhere else? Being realistic, it seems that in this early stage, people using ‘lawyerless’ smart contracts based on templates made by people they’ve never met may keep to relatively low value transactions. But, as the sector grows and the marketplace of contracts evolves, confidence will grow too. Look at something like eBay, where strangers buy and sell billions of dollars of goods each year, all with the most minimal of agreements. People now even buy and sell houses on eBay, i.e. this is not just about second-hand clothes. They even use an automated online dispute resolution system when deals go sour. That is to say, initially people doubted eBay could work, then they assumed it was just for little transactions, now they see it for the gigantic global digital marketplace that it is. Would that be wise? Shouldn’t people check with a lawyer in any case? Much depends on whether these smart contracts work. Do they execute? Are they legally compliant when someone challenges them? Put simply, will they generate trust, as something like eBay has developed trust? Only the market will decide, or the regulators who step in and forbid this. Either way, the times are changing and BlockCAT is a perfect example of the way lawyerless contracting is heading. If you’d like to see a short video about BlockCAT please see below.